South Jakarta Government monitors staple food price at Tebet Market, Thursday (6/7).
" Its price is stable. 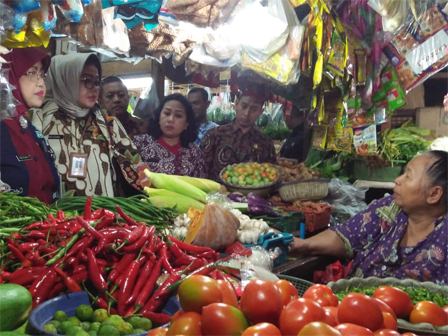 Even, most of the prices are down"
South Jakarta Secretary Assistant in Economy and Development, Sri Yuliani said, her side monitors staple food price on the location and it is still stable and no significant price increase. "Its price is stable. Even, most of the prices are down. Rice price is also stable," she confirmed. She mentioned, several commodity prices are cheaper such as curly chili from Rp 50 thousand into Rp 40 thousand per kilogram, big red chili from Rp 70 thousand into Rp 50 thousand per kilogram. Beef price is rising between Rp 5 thousand and Rp 10 thousand per kilogram. The same with chicken meat where it rises between Rp 3 thousand and Rp 5 thousand per kilogram. According to her, most staple food prices are stable because there is still many food stocks. She hopes staple food price can be maintained until D-1 of Eid thus it will not burden the people who will celebrate Eid. "Hopefully current prices can be maintained," she expressed.